I have spent most of my career as an investment banker and consultant conducting residential and commercial loan acquisitions due diligence; essentially buying loans from other banks. I’ve conducted loan purchase due diligence on literally billions of dollars of loans and have worked for Ocwen, Lehman Brothers, Goldman Sachs, Countrywide and many other institutional lenders conducting loan-level acquisitions due diligence. I have first-hand knowledge of: how Bank “A” buys loans from Bank “B”; individual loan analysis and portfolio pricing strategies; and put-back or repurchase provisions of loan purchase contracts. I have also been through Countrywide’s forensic loan fraud training. Finally, I maintain a Florida real estate broker’s license and I am a former Florida licensed real estate appraiser and title agent. I can’t imagine there is anyone better prepared to render advice and litigate mortgage loan issues. Our average client is probably $150,000.00 upside-down in a primary residence or an investment property. Our client base includes lawyers, banking executives, mortgage brokers, investment managers, real estate brokers and other business executives. The litigation goal of the vast majority of our clients is to get the lender to refrain from pursuing a deficiency judgment (cancel the promissory note) in exchange for surrendering the property or its equivalent value via final judgment, deed-in-lieu or short sale. 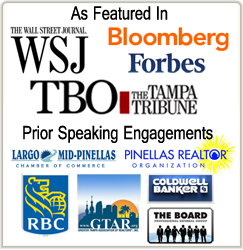 I also accept speaking engagements, and, over the past twelve months, have spoken at the Greater Tampa Association of Realtors (“GTAR”), the Mid-Pinellas Chamber, RBC Bank, and The Board Tampa Bay. Topics included: “The Financial and Banking Crisis”, “How Banks Make Decisions Concerning Upside-Down Loans”, and “The Statistical Correlation between Average Incomes and Average Home Prices”.